Difficult to keep because of their specialised dietary requirements dragonettes are nevertheless among the most beautiful fish available for the marine aquarium, so many people want to give them a try. If you do, what do you need to know to keep them healthy and happy? Sometimes dragonettes can be persuaded to eat brine shrimp or mysis, but you should not rely on this. Most only eat amphipods, copepods and similar creatures, and if there are not enough of these in your aquarium then they will starve, no matter how much other food you add. For this reason they should only be kept in mature aquariums with plenty of live rock for the small crustaceans to live on. You may be able to obtain suitable food from your local fish shop, but this will be difficult as dragonettes need to graze constantly in order to survive. Even with a well established aquarium it is unwise to keep more than two as malnutrition can be a serious risk. Besides their special food requirements, dragonettes are highly sensitive to changes in water quality and should always be kept in very clean water. Since they do not have scales they are particularly vulnerable to heavy metal poisoning and you should avoid treating them with copper based medication. Their skins exude a noxious slime to protect them from predators. When under extreme stress they may produce so much of this that it suffocates them, so you should always handle them gently and never attempt to move them in a net. Dragonettes are shy, peaceful fish and should only be kept with other fish of similar temperament. They won't cope in a tank where other fish compete aggressively for food. They have spines with which they can inflict painful puncture wounds, though they use these only as a last resort, in self-defence, and they are not believed to be venomous. Dragonettes are also known as mandarinfishes, and there are several varieties which, if dietary issues can be resolved, are suitable for the home aquarium. Sand Dragonettes -Quite different from their vivid cousins, these slightly larger fish have flattened bodies and sandy colouration. They need a sandy substrate to burrow in. Painted Dragonettes -These slender and elongated fish have a basic spotted pattern which differs between males and females. They prefer a well planted aquarium. 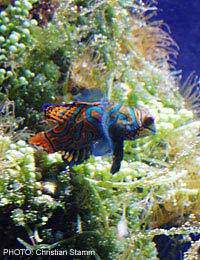 Green Mandarinfish -Also known as striped mandarinfish, these elaborately patterned, peaceful fish need quiet tankmates and plenty of hiding places. Psychedelic Mandarinfish -Also called spotted dragonettes, these spectacular looking but shy fish need a soft substrate to hide in at night. Avoid anemones in the same tank and don't keep males together. If you succeed in successfully establishing a pair of dragonettes in your aquarium, the chances are that they will breed. Dragonette courtship is elaborate and involves prolonged dancing. When they are ready to spawn, they will spiral around each other vertically in the water, releasing the eggs and milt. The fertilised eggs will drift in the water and must be removed immediately to prevent them from being eaten. Dragonette fry are difficult to rear largely because they are difficult to feed. Some will take very small rotifers, but your best bet is marine infusoria. Provide a sandy substrate in your fry tank for the fry to burrow into as they grow bigger. Dragonettes are truly fascinating, beautiful and graceful fish with pleasant temperaments. If you can provide for their needs and are willing to make the extra effort necessary to take good care of them, they can make a wonderful addition to your aquarium.